Long complicated recipes are great once in awhile, but when it comes to everyday cooking most of us need fast and easy recipes. That is why I am loving my 5 Ingredients or Less series. I love sharing recipes that make your life in the kitchen easier. Simple recipes that call for less than five ingredients does just that. They are easy to make and take very little time. We have made a page with all my 5 Ingredients or Less Recipes on it. I will continue to add recipes to it and update it as needed. So be sure to bookmark, Pin, or share this page for future reference. Today for my 5 Ingredients or Less series we are talking Dump Cakes. Dump Cakes are one of the easiest dessert that you can make. And they are a dessert that anyone can make. Dump Cakes are a fun dessert for kids to make. and even the non cook can make a dump cake. They really are easy to make and taste great! 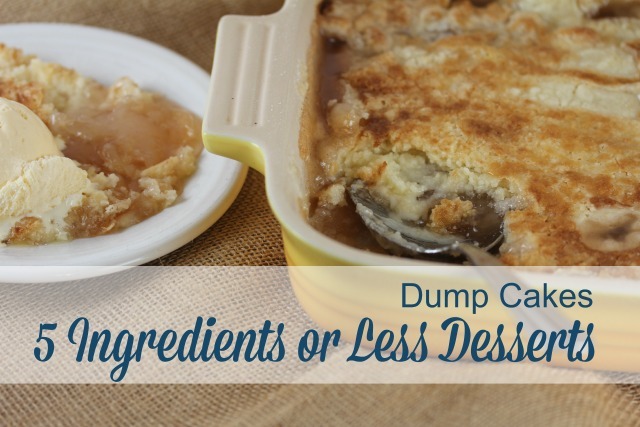 The fun thing about dump cakes is that there are so many different variations and versions. A basic cake mix, some sort of fruit, and butter. Some also call for a can of pop or soda and/or nuts. Yesterday I asked this on my Facebook Page. I am writing a post on dump cakes. You know the dessert/cobbler that many of us grew up eating that uses a cake mix and some sort of fruit or pie filling. I would love to hear your favorite type or flavor of dump cake. Do you make the classic basic version or do you have a fun variation to share? I loved hearing how you all enjoyed this desserts. One of you mentioned a strawberry dump cake and that sounds delicious. I have had a lot of versions of dump cakes, but I don’t think I have ever had a strawberry one. I am going to have to try it. If you have never had dump cake, or have never made one, you need to. 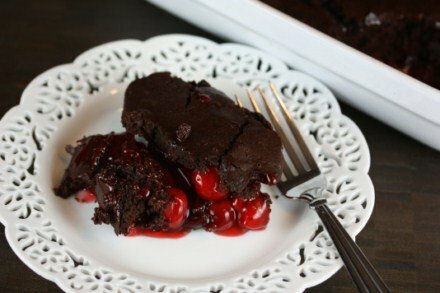 They are one of my favorite desserts to make. Here are a few of my favorite dump cake recipes. I would love to hear your favorite version of dump cake. Do you make the basic versions of apple or cherry or do you change it up to something else? First melt the butter in bottom of cake pan. Mix the flour, sugar, milk, baking powder and pour over the melted butter. Now the fun part! Use about any kind of canned fruit pie filling OR, (and I prefer this) about a quart jar of drained fruit. I can apricots, peaches, blue plums to mention a few fruits I use regularly. I also can pears but have not tried those. I do not miss the extra “glue” from canned pie fillings and it saves a few sugar calories. Bake at 350 till golden on top, maybe 30 to 45 minutes. Cool or warm, with ice cream, whipped cream or a splash of liquid cream this is quick, easy and delicious. Thank you for sharing that! I love homemade versions of things, so I need to try that!